The fact that federal studies have found Public Markets to be the most effective tool for job creation (see earlier reference to the O.T.A. study in the “What is a Public Market” section) should mean that Public Markets could be the centerpiece of a national effort to stimulate the economy and create new jobs and entrepreneurial opportunities. Over the last 50 years, the paradigm for national economic development policy has encouraged the export of center city jobs and economic opportunities to suburban communities. This was done by governments using public funds to underwrite the necessary water and sewer works, highways, utilities, industrial parks, and other infrastructure projects. 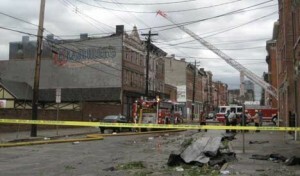 A Street by Cincinnati’s Findlay Market prior to the Market’s renovation. These expenditures, as well as decades of tax abatements were granted in the hopes of creating new industrial and corporate jobs. Unfortunately, the result was all too often an increase in center city poverty and unemployment with its attendant loss of a tax base, rise in crime and hopelessness, as job opportunities were shipped out of the center city communities where low income and minority residents were often concentrated. 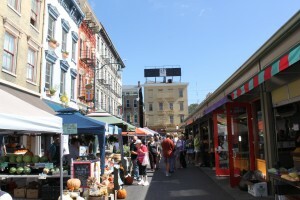 A Findlay Market streetscape following the Market’s revitalization. In contrast, Public Markets have a proven history of turning derelict neighborhoods into successful, thriving communities. The S.B.A. 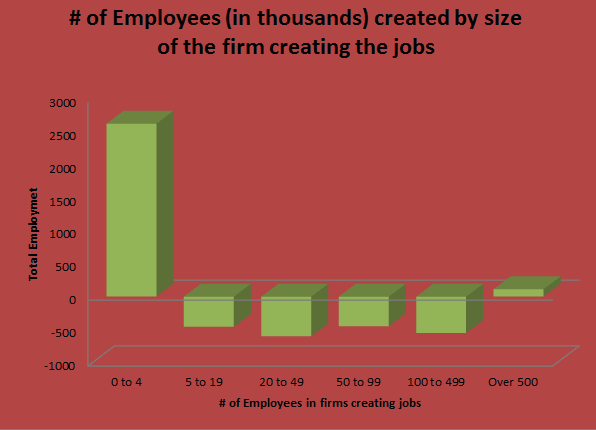 Chart that follows, dramatically shows that virtually all job growth in the economy is created by “micro-enterprise” firms employing 0-4 employees. 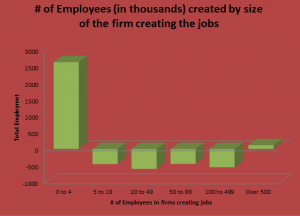 In fact, firms that receive the lion’s share of government subsidies – those with hundreds of employees, have been responsible for the loss, through outsourcing, of millions of jobs. While the SBA chart below is somewhat dated, today’s figures are similar. These jobs have been lost and will continue to be lost to Singapore, Thailand, Mexico, China, India, and other “third world” countries – as the world economy reorganizes in the 21st century. This disturbing trend gives no indication of abating. Public Markets succeed by throwing a “tent” over local micro-enterprises By providing the critical mass, technical support, and home grown vitality, they help these new enterprises to prosper and grow. In doing so, Public Markets are the institutional embodiment of the Chinese proverb: “Give a person a fish and feed them for a day, teach them to fish and feed them for a lifetime”. The most significant economic impact of Public Markets is in their secondary economic effects. 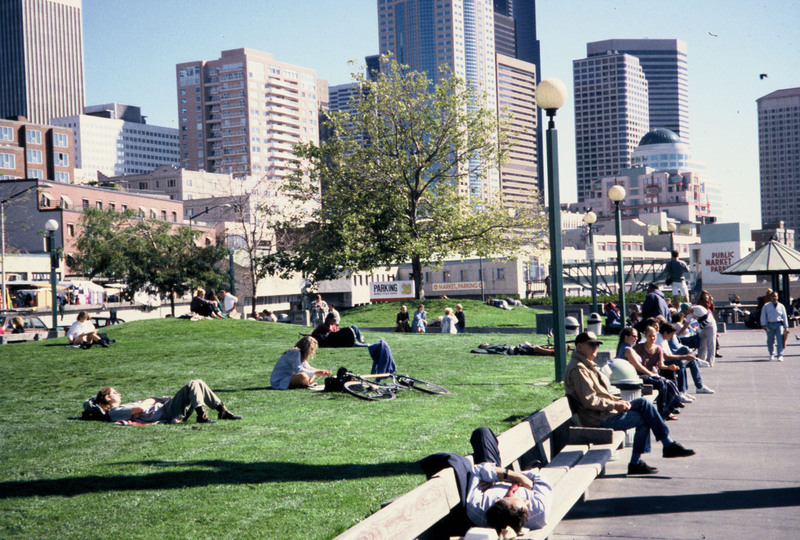 For example, the redevelopment of Seattle’s Pike Place Market led to over $300,000,000 in surrounding private investment. This transformed a neighborhood that had lent the term “skid road” to the English lexicon, into a healthy, mixed-income community with sought after condominiums with multi-million dollar price tags – without causing the displacement of the stable, low income elderly residents who historically had populated the neighborhood. For a well done study that details the primary economic impact (direct jobs, new taxes, etc.) of Pike Place Public Market: Click Here.